Make Donut size: 3cm-5cm, 5cm-7cm, 7cm-10cm, 8CM is the common size in supermarket and donut chains. 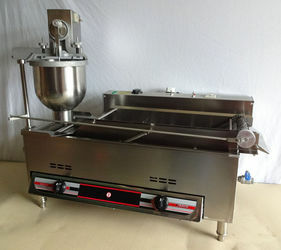 500-1200pcs/h Automatic donut maker, donut making machine. As each Donut is dispensed from the hopper it drops into the oil and then moved down the oil carriageway via conveyor chain in the carriageway. Small in size, light and convenient, flexible, beautiful shape. Donuts can be made in just a few minutes. Stainless steel case, cast aluminum model, high electrical conductivity, and the donuts can be heated fast. Adopt electronic oil temperature control and display system, the oil temperature display be clear at a glance.